Mini Metro ($4.99) by Dinosaur Polo Club is a subway management simulator that also throws in some puzzles into the mix. If you are a fan of the inner workings of a city and their subway system, and have been craving a simulation puzzle game that uses this concept as the premise, then you won’t be disappointed with Mini Metro. The game was originally released on Steam for Windows, OS X, and Linux on Nov. 6, 2015, and is just now available on mobile for iOS and Android. As an Angeleno who has frequently taken the Metro train system in Los Angeles, I’ve become fascinated with the train layouts and subway structures in other cities. As much as I wish the trains and subways in Los Angeles could one day be more like New York’s system, it’s still useable in the current state (we can finally get to Santa Monica by train again). It’s been interesting to see how the city plans out new train lines, and watch the progress unfold right before my eyes. While I don’t have any experience in working on trains or for the city, I’m still curious about the process, so when I heard of Mini Metro being available for iOS, I was pretty excited. 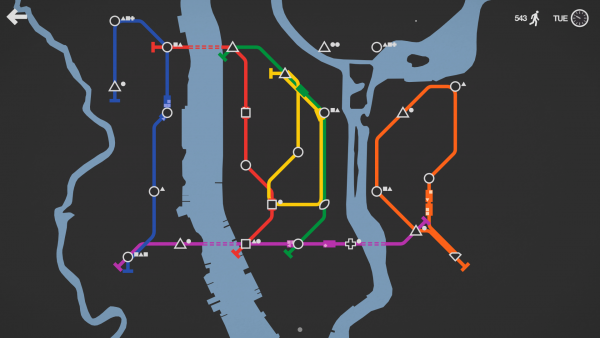 Finally, a game that let’s me see a different perspective of how to plan and build a city with a subway system! 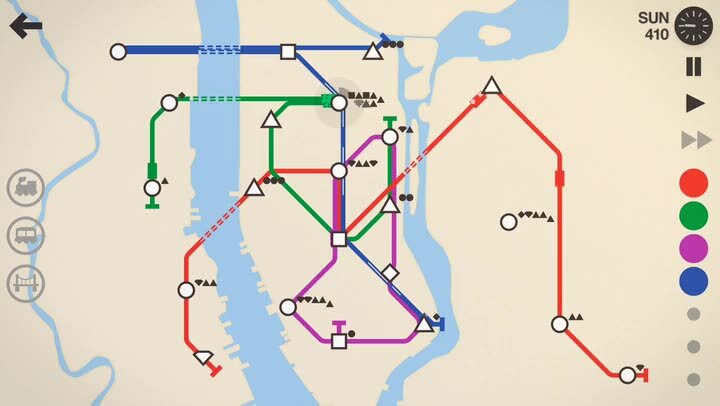 Needless to say, this game does not disappoint, and it’s great for everyone, even those who have never heard of Mini Metro until now. 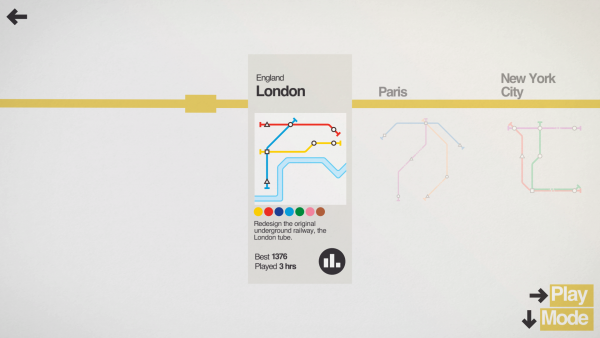 In terms of visuals, Mini Metro is gorgeous with a minimalistic aesthetic that closely represents posters I’ve seen for train station maps from all over the world. The game features a light cream beige backdrop that makes it easy to see the colored train lines and various tunnels and rivers that are in place for each of the real world locations. Each station is represented by a different geometrical shape, so it’s not hard to see how you should be connecting some stations together. The colors are bright and vivid so there is nice contrast with the background, but the game also features Colorblind and Night modes as well, which is nice. Animations in Mini Metro are buttery smooth as the trains move around the city and pick up passengers, and there are also nice transition animations between menus too. 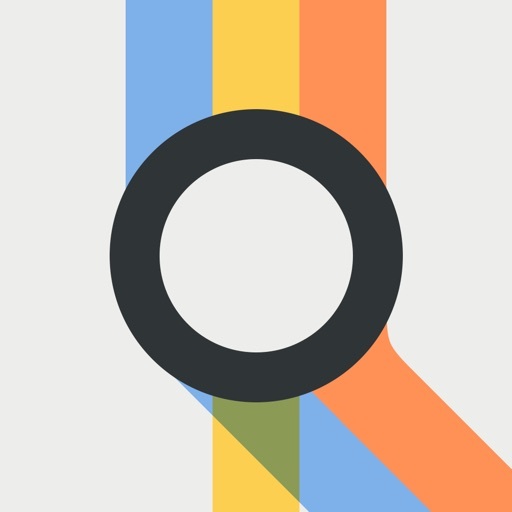 Mini Metro does not feature a static background soundtrack, but the sound effects that you hear as you play are fairly realistic and definitely get you in the mood for public transit without the hassle of reality. The subtle tunes you do hear are dynamic, and depend on the subway system that you’re building, which is cool. 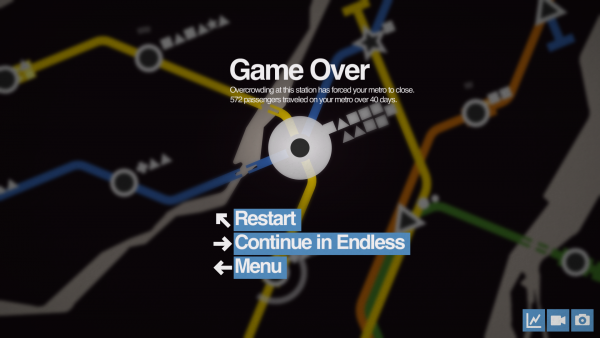 There are several different ways you can play Mini Metro. 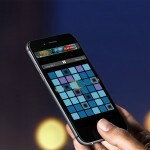 The first is the Standard mode, which you can play in either Normal or Extreme difficulties. 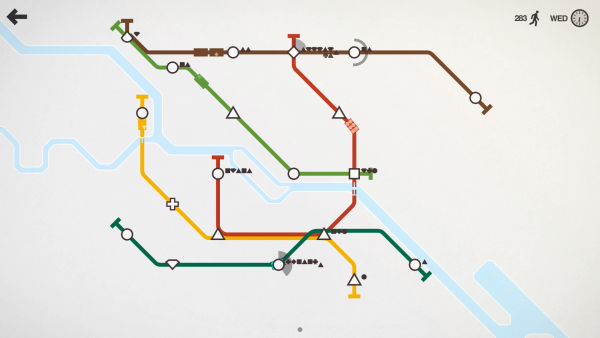 Normal lets you rearrange tracks as needed to prevent overcrowding of stations, which will end your Metro system if there is too much overcrowding. Extreme is for the more experienced player, as you’ll have to prevent overcrowding but the tracks you lay down are permanent and can’t be changed. There are 13 levels based on real-world locations, such as London, New York, San Francisco, Hong Kong, Osaka, Melbourne, and more (I’m a bit saddened to see that Los Angeles isn’t one of them). There is also a Daily mode, where you can compete with other players from all over the globe for the best score on a preset map each day. While Daily mode maps remain the same for each player who is competing, the standard levels always randomize the city growth, so each game you play will be unique in its own way. 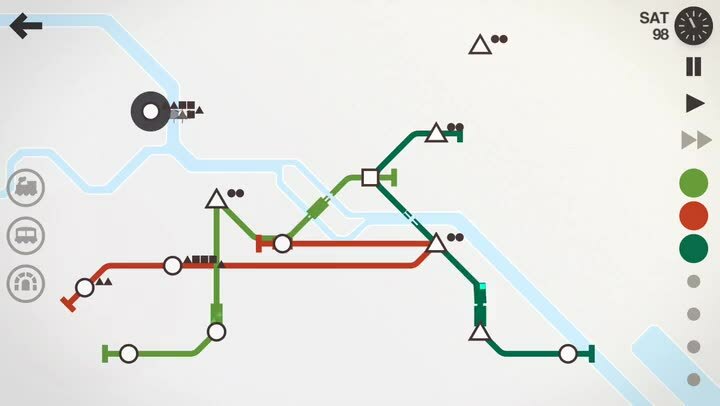 The controls in Mini Metro are simple — just draw lines to connect stations together and get the trains running. You can see how much time has passed since you opened the Metro in the top right corner, and tapping this brings up a few button options, such as pausing/playing, and fast forwarding so things move faster. 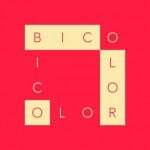 As you get new lines added to your system, you can select the color you want to lay out by tapping on it. You’ll also get upgrades for your system, like more train cars, larger capacity train carriages, tunnels, and tracks after each week passes, which will help you expand and grow. To use these available upgrades, just tap the icon of the one that you want to use (on the left side of the screen) and then place it on the system where it can be used. As the city grows, you’ll see smaller shapes that represent passengers and the lines that they want to take to get to their destination — keep an eye on these and make sure that you can build your tracks efficiently to satisfy everyone’s needs, because otherwise, stations get overcrowded, you get shut down, and it’s game over. Your score is determined by how many commuters you were able to serve over the course of the system being open. 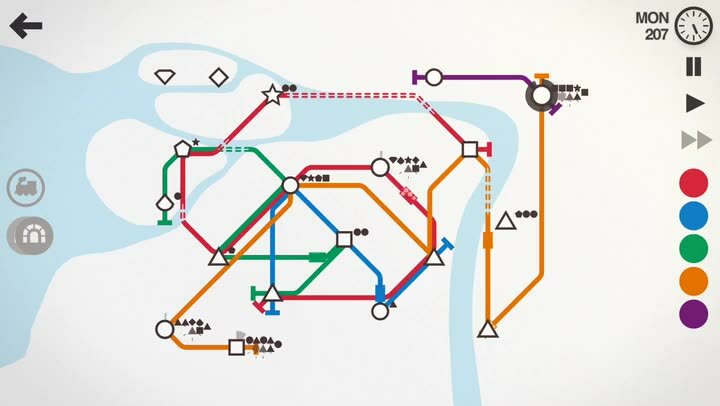 To unlock the other maps, you’ll have to reach a certain point threshold, so it’s important to plan efficiently in Mini Metro. I have only played a few rounds of Mini Metro so far since downloading it this morning, but I’m in love with it so far. The game’s minimal look and feel is endearing and represents the source material well, plus the dynamic sounds are a nice touch. Controls are intuitive and easy to learn, but mastering efficient track planning is a difficult but welcoming challenge. Even though 13 different maps may not seem like much, thanks to the randomly generated stations and city growth, it’s never going to be the same experience. I hope that more maps (cough, Los Angeles, cough) are added in the future, as it will only add to the already high replay value. 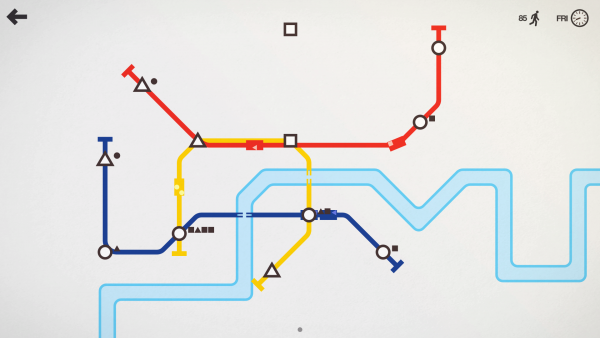 I highly recommend checking out Mini Metro if you’re into simulation and puzzle games and enjoy dealing with the intricacies of public transit and city planning. You can find Mini Metro on the App Store as a universal download for your iPhone and iPad for just $4.99, and it is well worth every penny. If you prefer to have Mini Metro on your desktop or laptop computer, it is available on Steam (Windows, OS X, and Linux) for $9.99.